Uzwil (Switzerland), August 22, 2016 – How to feed nine billion people healthily and sustainabily? 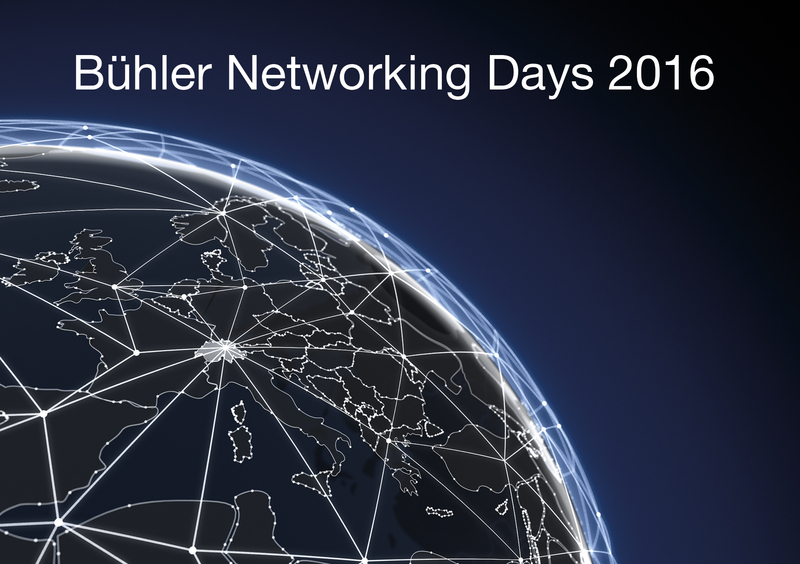 Bühler addresses this challenge, together with key customers, scientists, and partners at the Bühler Networking Days. Around 750 participants take part in this key industry event. “We take the responsibility of the food and feed industry for a sustainable world very seriously. It is time to step up and make a difference,” says Stefan Scheiber, CEO of the Bühler Group. At the Bühler Networking Days, the company presents innovations that make a contribution to a sustainable food value chain, by increasing energy efficiency, yield, and quality, at lower costs. The challenges for the food industry are enormous. Around 65% of global water consumption and 25% of all energy use is related to food and feed production. The world population is still growing and more than 30% of all food is wasted. Developed countries suffer from overweight and obesity with an estimated impact of 2 trillion USD worldwide. At the same time, an estimated 840 million people suffer from hunger. The world population is predicted to grow to over 9 billion by 2050. Feeding them healthily and sustainably poses a huge challenge for the agricultural systems and the entire food industry. Furthermore, even today’s production of animal protein is not sustainable. Only 40% of vegetable proteins (in the form of rice, corn, wheat, or soy) land on our plates, with the rest ending up in the stomachs of livestock or as food waste. Despite all efforts and political climate agreements, no turnaround to a sustainable economic set up and grain value chain has been achieved so far. “It’s time now that the private industry steps up and makes a difference,” says Bühler CEO Stefan Scheiber. Bühler has made the commitment to address this challenge globally, with its key customers and partners at its newly established Bühler Networking Days, where around 750 leaders from industry and science are discussing megatrends that are shaping the grain-processing industry: nutritional trends, sustainability, food and feed safety, and the Internet of Things (IoT). Stefan Scheiber, Bühler CEO, and Johannes Wick, CEO Grains & Food at Bühler, have opened the Bühler Networking Days today. “As the leader of our industry, we want to anticipate megatrends and lead the discussion about how our businesses will evolve in the future,” says Stefan Scheiber, “Our industry plays a key role – since corn, rice, and wheat are the most important staple foods for four billion people. And with the impending protein gap, grain-processing will become even more important,” says Scheiber. During the three-day event, top speakers provide valuable insights into the latest developments in the areas of nutrition, food and feed safety, sustainability, and IoT. Break-out sessions, expert tours, and a major solutions space are creating an inspiring environment, in which participants can exchange and develop ideas, network, and discuss how the grain-processing industry can address the challenge of feeding nine billion people healthily and sustainably. Bühler’s long-standing commitment to educating and training customers to be able to operate the latest equipment sustainably, is also reflected at the event, with the presence of the Swiss and the African Milling Schools, as well as the Swiss Institute of Feed Technology.